Since we introduced it in our catalog, the Quick-Shot™ shotgun/rifle holster has been a popular item improving safety, reaction time and reducing fatigue by reducing gun weight by up to 75%. 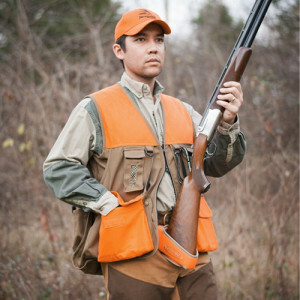 This week were pleased to announce that the product is now available in hunter friendly “blaze orange”. Learn more from the full description below or ORDER HERE! The Quick-Shot™ takes the weight off of your arms and lets your legs do the work. Using the Quick-Shot™, the weight load on your arms can be reduced by up to 75%! Example: an 8 lb 6 oz over and under shotgun feels like a 2 lb 5 oz BB gun when in your Quick-Shot™ (i.e. a 72.4% weight load reduction!!! )By eliminating the undue burden on your arms you’ll hardly notice the weight of your firearm. This means you will be rested and alert when it’s time for the next shot. Additionally, youth and small frame hunters will be able to better enjoy their hunting experiences without being overly exhausted. This entry was posted in New Products and tagged New Products, Quick-Shot. Bookmark the permalink.